We are a professional, hard-working team dedicated to high standards of workmanship. We look forward to working with you to make your dream home a reality! Our goal is to deliver beautiful and functional spaces through a client-designer relationship based on integrity and collaboration. Urban Home is a luxury interior design boutique offering specialized residential, commercial and hospitality design services and space planning, on-site consultations, material selections and more. When SELLING, we work together with you to ensure your property is positioned to secure the maximum selling price. When DWELLING, the focus is on YOU, what you love, and how want to live! MAD Builders LTD is a Richmond Hill based custom home builder & remodeler. We provide outstanding service, great results, and stand behind the work we do. Ella Staging & Design Inc.
Ella Staging & Design Inc. offers clients the knowledge and creativity necessary to exceed their needs. When designing or selling your home, trust us to deliver your ultimate vision. GTA's Creative Interior Designer - Best of Houzz Winner! The concept of what makes a house a home is highly personal. No matter your aesthetic, Vanessa strives to design a space which suits both you and your lifestyle. Designs Inspired by Your Lifestyle. EDIT Design Inc. was founded by space planning specialist Edit Kasza. Her years of experience, natural creative abilities and problem-solving skills, with state-of-the-art 3D Computer Aided Design Software helps individuals to navigate through the remodeling process. Professionals – builders, contractors, landscape artists, real-estate agents – are using EDIT Design Inc. custom design services to complement their existing range of services. Clients are reassured that they are receiving independent unbiased advice from an expert. Our transparent process and app puts you at the centre of the architectural design and build process by providing you with the flexibility to make the revisions and upgrades you want at cost. David Small Designs is an award winning custom home design firm that specializes designing the perfect home for each client from start to finish. Contact us today, we'd love to hear from you! Whitefish Architecture provides modern ecological building design and integrated environmental site design in South Western Ontario and Central America. Our office is based in Kitchener-Waterloo. We are driven to do better, to reduce our impact on the planet, and provide you with space that is efficient, intelligent, and inspiring. We specialize in houses, low to mid rise multi-unit residential, and small to medium scale commercial projects such as retail, restaurants, facades and offices. We enjoy working with historic structures, and bring new function, light and life as well as vastly improved efficiency to many older homes and buildings. We can design to Passivhaus standard, or provide you with a healthy, incredibly efficient, budget conscious design to whatever level you desire. Areas of additional expertise include permaculture design, working with natural and experimental materials, tiny homes, accessory dwellings in urban areas, and sacred spaces. Our clients want to create spaces which are modern, beautiful, functional, and economical, while reducing energy usage and improving work and life environments. We strive for candor and objectivity, using advanced design thinking to solve your problems. We don’t preach, we listen and collaborate to help your space realize its full potential. We also help you do more with less, and rather than chasing McMansions, we encourage efficiency throughout our design process even if it means smaller fees for smaller builds. You can hire us for anything from minimal to full architectural services. You might want an exploration of opportunities, in the form of a feasibility study or sketch studies of a potential project. We also provide full traditional architectural services, involving schematic design, detailed design and specifications, permit and construction drawings, contractor selection, and contract administration and oversight. We will meet with you for free to discuss your needs, and provide a fee proposal which is tailored to your project, budget, and timelines. We are a Full Service Interior Design & Construction Firm specializing in renovations, additions and new builds in Richmond Hill. Allow us to create a unique space, tailored to your needs & style. McNicol Interior Designs is a full service firm specializing in residential interiors, with over 10+ years of experience, in Southern Ontario and the GTA. Hunke Construction Inc. was established in 1976 servicing the Kitchener – Waterloo and surrounding areas. Our commitment then and now is to serve the best interests and needs of our customers in an efficient and cost-effective manner through: - Listening to our customers needs - Make sure everyone is clear of deadlines and costs before starting a project - Strong communication during the project - Respect and Loyalty to our customers - Quality construction performance creating value for our customers - Personal attention to meeting and exceeding commitments to our customers - Commitment to a safe work environment - Be environmentally conscientious - Ethical business practice Our concept has proven over our successful 35+ years in business. We are proud to bring on the next generation of Hunke Construction Inc. to carry on the family name as we continue business. We look forward to working with you! Tango Design Studio is a boutique firm specializing in the design, supply and installation of kitchen and bath cabinetry. 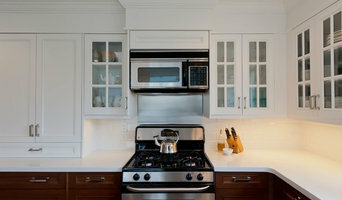 We also offer cabinetry solutions for other rooms in the home. We offer a wide assortment of Residential Interior Decorating and Design Services including: Aging-in-Place Renovations and Home Modifications for Seniors. With over 25 years of combined professional design and installation experience, husband and wife design duo Anne and Rick Vernon, (Interior and Landscape Designers), provide a unique service with their ability to address the whole home, inside and out. We specialize in creating complete customized home renovation solutions. If you’re looking for a complete home remodel or just partial renovation, count on us for professional services. Kevin Crozier, B. Arch and Crozier Designs Inc. has been creating unique custom homes and cottages since 1987. Crozier Designs specializes in Cottages, Rural Properties, and Additions to Older Homes throughout Southern Ontario and has experience in most cottage areas serving Southern Ontario. Kevin divides his time between summer cottaging in Muskoka and Georgian Bay with winters in Collingwood skiing with his family. When not enjoying the cottage and rural landscapes of the near north Kevin lives and works in Fergus Ontario providing design work for renovations and new builds in the Guelph, K-W and Cambridge area. We have been in business for over 25 years helping our clients transform their homes into a stylish haven. Our goal is to offer you a one-stop, turn-key solution for your next project. After many years of service in the Kitchener community, we feel confident that we can cater to your needs. We get the job done and we don't just meet expectations; we exceed them. Our customers keep coming back because we're dependable, knowledgeable and pleasant to work with. Our employees provide unmatched service, delivering top quality service for your business! Each is committed to personal service. In keeping with this desire, we're not satisfied with our work until you are. Aside from our amazing staff, we take the time and care to make sure even the tiniest detail is managed, in every circumstance. There, really, is no other way. Alex Conibear is a Toronto-based designer who brings to you project passion, and creative skills backed by experience with a variety of multi-cultural styles of art and architecture. Kentwood Construction provides quality renovation and new construction services to discriminating customers in southwestern Ontario. Those services include home additions, kitchen and bath transformations, new custom homes, along with modifications to assist those with disabilities or to facilitate aging at home. Our emphasis on high quality workmanship and integrity in our business dealings leads to repeat customers and having most of our work come from referrals. If you become a Kentwood Construction client, it is our intent that you will become both a friend and a client for life. In her experience as owner & designer, Christine knows how to create beautiful, stylish spaces while maintaining tight budgets, balancing multiple priorities & building relationships with clients. JWS Woodworking and Design Inc.
JWS Woodworking and Design Inc. is a small, client centered design & build firm based in Waterloo Ontario, Canada.. We have two divisions. One dealing with quality custom built ins and one that deals with higher end outdoor landscape and woodworking. We are a premier builder that has become known for surpassing industry standards and exceeding customer expectations on a regular basis. We specialize in outdoor items such as decks, fences, gazebos and pergolas; as well as indoor items such as fine cabinetry, mantels, bookcases and full renovations. Whether your style is traditional, eclectic or contemporary, I will work with you & listen to your ideas & aspirations while adhering to your budget guidelines to create a space suited just for you. We are a fresh & forward thinking design/build firm that is driven to create extraordinary spaces, including designer interiors, unique kitchens & extraordinary bathrooms on realistic budgets.